Crafted out of 16-gauge steel and fully welded, the DVR box has an inside depth of 26-3/4" to fit deeper DVR's and other components. 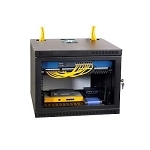 Designed to house your surveillance and monitoring equipment, DLBX Lock box features tie points, knock-outs and cable pass-through for a custom looking set-up. 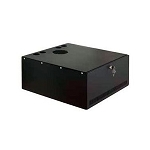 This DVR lock box has great cooling capabilities because it includes two (2) 4-1/2" ball-bearing fans that are mounted on the right and left side moving air our the rear panel and washable filters to keep dust build-up off your equipment. 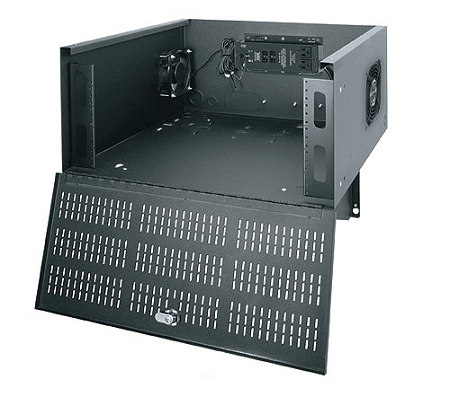 Mount Middle Atlantic's DLBX Security DVR box on counter tops, shelves, or vertically or horizontally on walls, its even so versatile use the box as a shelf to save space. Click the "Specifications" tab for dimensions and click the "More Information" tab for additional info. Key locking hinged front door for easy access. Dual fans for maximum venting.